An excellent way to carry art with you. This piece features a fabulous smiling clown from an antique circus poster scene. Comedy, comedy comedy! Give us a good laugh anytime. 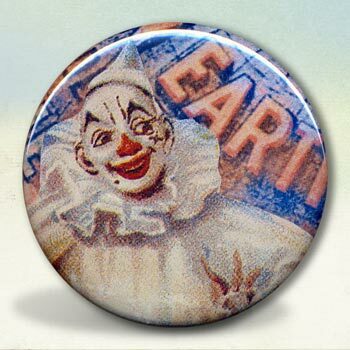 We love the history of clowns and jesters, Pierrot and the Harlequin. Poking the ribs of all of those that need a good ribbing. We love the sheer entertainment value of a good clown too. The brilliant wigs, outlandish costumes and makeup. We love that there are people who dress up and play the part of the silly fool for the sole purpose of making us laugh.